Nations throughout Africa have The Big Five (the little five too), Australia has Koalas and Kangaroos, the United States has the Bald Eagle, and Canada has the noble Beaver. Every corner of the world has its species that help to define cultures, geographies, and national identity. However, these five nations have taken their pride in biodiversity to another level by canonizing species and ecosystems on their currency. Many nations have a few species on their banknotes or coins, but these five in particular, stand out as featuring at least one species on each denomination of their bills. 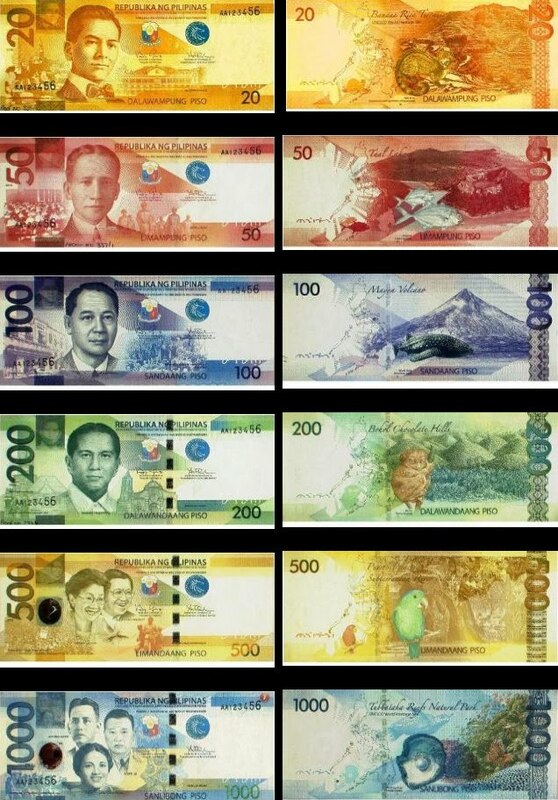 In all, the currency below represents 30 focal species and a diverse supporting cast of background species. Of these species five have not yet been evaluated by the IUCN Red List, eight are Least Concern, seven are Near Threatened, three are Vulnerable, five are Endangered, and one is Critically Endangered. Unfortunately due to understandably strict copyright laws, posting images of actual money from each of these nations is highly restricted. Consequently, you’ll have to click the links or pictures below to see images of each nation’s beautiful currency. These species are no strangers to the conservation limelight and are colloquially known as “The Big Five.” They occur all throughout sub-Saharan Africa and many are featured on the currency of several different nations. Their existence in the wild drives an enormous amount of international travel to South Africa for the chance to experience their presence. 10 Rand: White Rhino (Ceratotherium simum) Near Threatened. The Philippines have made giant strides in acknowledging the phenomenal biodiversity within their borders, especially the astounding marine biodiversity. In 2010, they released their newly designed paper currency that, like South Africa, highlights one focal species per bill. Unfortunately there were a few small errors in species names which they honorably included on their bank notes and some minor misrepresentations of species features and island locations. Regardless, it’s clear that The Philippines are committed to promoting their biodiversity as a national treasure, and so they should as one of the global Biodiversity Hotspots and a Megadiverse country. Like three of the other nations on this list, Brazil has some of the world’s most biodiverse regions including the Amazon rainforest and the Eastern Coastal Forest. However, Brazil is a large nation and includes many ecosystems that harbor an astounding assortment of species. First issued in 1994, these present-day bank notes heavily feature one species per denomination, but also leave some room for a supporting cast of background plants and ecosystems. The currency of New Zealand features ecosystem scenes from a sample of the range of ecosystems that occur throughout the island nation. 80 million years of geographic isolation has led to New Zealand being one of the most uniquely biodiverse regions on the planet. The five-dollar note features Campbell Island, New Zealand’s southernmost island and the location of one of the largest island restoration projects in the world that has eradicated all invasive rats. What is distinctive about this currency is that it displays species of native birds as components of their natural habitats and ecosystems, reinforcing the idea that species conservation is often directed at focal species, but that these species cannot exist outside of the connections they share with their biological communities. Also notably is that these five species aren’t typically associated with New Zealand, which is a wonderful way of broadening the public’s taxonomic horizons. Although, definitely biased towards birds these notes are a fantastic example of how national identity can be tied to species and their habitats – a definite and respectable source of pride for Kiwis. 20 Dollars: Karearea or New Zealand Falcon (Falco novaeseelandiae) Near Threatened; Marlborough rock daisy (pachystegia insignis) Not Evaluated; Flowering red tussock (Chionchloa rubra) Not Evaluated. 50 Dollars: Kokako or Blue Wattled Crow (Callaeas cinerea) Endangered; Supplejack vine or kareao (Ripogonum scandens) Not Evaluated; Sky-blue mushroom (Entoloma hochstetteri) Not Evaluated. 100 Dollars: Mohua or Yellowhead (Mohoua ochrocephala) Endangered, Red beech or Tawhairauniui (Nothofagus fusca) Not Evaluated, South Island Lichen Moth (Declana egregia) Not Evaluated. Probably one of the greatest success stories in conservation is that of Costa Rica. In the past thirty years, this small Central American nation has captured the imagination of the world by transforming itself from a nation based on extractive industry to a model for biodiversity conservation. This is due in no small part to the leadership of the Costa Rican government and its people in recognizing the potential and value of biodiversity on a global stage and acting to protect biodiversity as a national treasure. 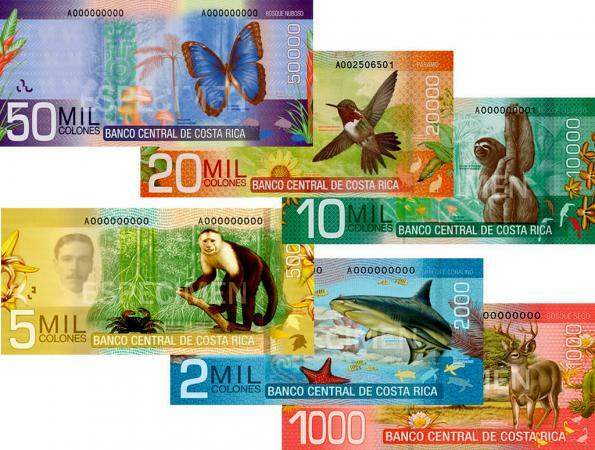 Unveiled in 2012, Costa Rica’s new bank notes feature flora and fauna from the six ecosystems that exist in the country: Cloud Forest, Paramo, Rainforest, Mangrove, Coral Reef, and Dry Forest. The species on these bills span taxonomy and proudly feature invertebrates and fungi on the largest denomination – the largest bank note ever produced in Costa Rica. For Costa Ricans, biodiversity is largely the focus of their affection and national pride; nowhere is this better conveyed than on their beautiful currency. 1,000 Colones: Dry Forest Ecosystem: Guanacaste Tree (Enterolobium cyclocarpu) Not Evaluated, White-tailed Deer (Odocoileus virginianus) Least Concern, pitaya, cactus flowers, scorpions. 2,000 Colones: Coral Reef Ecosystem: Bull Shark (Carcharhinus leucas) Near Threatened, sea feathers, turtles. 5,000 Colones: Mangrove Ecosystem: White-Faced Monkey (Cebus capucinus)Least Concern, red mangrove, mangrove crab. 10,000 Colones:Rainforest Ecosystem: Three-toed Sloth (Bradypus variegatus)Least Concern , Orchid, Mushroom Cup. 20,000 Colones: Paramo Ecosystem:Volcano Hummingbird (Selasphorus flammula) Least Concern, sunflower, hares. 50,000 Colones: Cloud Forest: Blue Morpho Butterfly (Morpho peleides) Not Assessed, mushrooms, bromiliads, beetles. The future requires investment and these are five of the many nations that are banking on biodiversity. They may seem to contain exceptional amounts of biodiversity, but every nation has a part to play in protecting and managing the wildlife that happens to find itself between borders. The species on each one of these bank notes was carefully deliberated and chosen and these discussions probably included a diverse group of people whose lives and work may not typically venture into the world of biodiversity conservation. However, through the official recognition of species and biodiversity as national symbols they have built broad cultural recognition for biodiversity and a bridge for understanding how important biodiversity is for them, for their citizens, for their nation, and for anyone else who is willing to bank on Nature.